Bring 1 and 1/2 cups of water (375 ml) to a boil in a medium sized saucepan. Add sushi rice, stir and cover. Reduce the heat and simmer for 20 minutes until the rice absorbs the water. In a small bowl, combine the rice vinegar, salt, pickled ginger and sugar. Blend this mixture into the sushi rice. Preheat oven to 300° F, 150° C, or Gas mark 2. Heat a nori sheet for 1 or 2 minutes in a baking tray, until warm. Feel both sides of the nori sheet and lay the rough side facing up on the bamboo sushi mat. Wet your hands and start spreading a thin layer of rice equally on the nori, covering the entire sheet. Now place a slice of your favorite seafood along with a fourth of the vegetable slices towards the edge of the nori sheet closest to you. Starting with the edge closest to you, gently yet tightly roll in the ingredients, making a complete roll. Use a sharp, wet knife to cut each roll into 4 to 6 small sushi rolls. Serve immediately with soy sauce and wasabi. Once you know howh to make one sushi recipe, you’ll be able to make any sushi recipe. 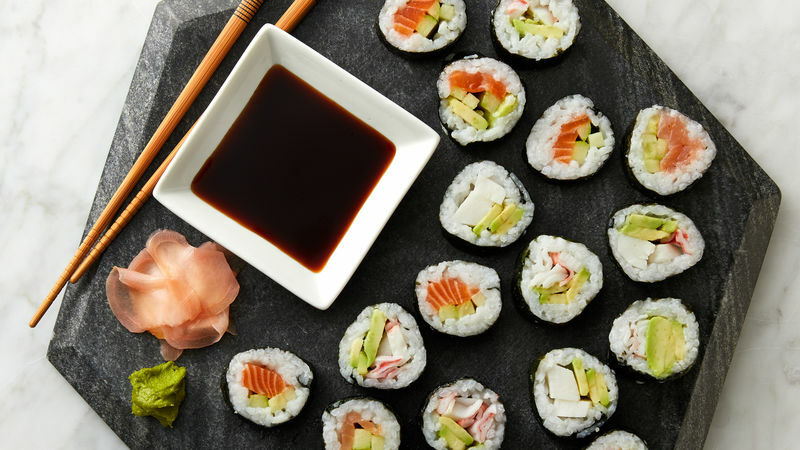 You can create endless combinations for sushi, but whatever you do, make sure that you use short-grained sushi rice because plain ol’ white rice just won’t do. This is also called short-grain Japanese rice or you can use medium-grain California rice, but most stores in the U.S. will label it as sushi rice. And if the idea of eating raw seafood doesn’t appeal to you, you can easily use cooked seafood instead or omit the seafood altogether and go for a vegetarian roll!